← Learn How Folding Security Gates Can Save You Money! Security Gates Are A Visible Deterrent To Smash & Rob Criminals! Business owners are investing in storefront security gates for protection from smash and grab criminals and lower their insurance rates at the same time. Recent criminal activity statistics show a break-in takes place every 4 seconds in the United States. In New York you have a 1 in 16 probability of having an unlawful break-in taking place to your business or home. Security cameras can help to catch the criminals after the damage has been done however they actually do not help to avoid a criminal activity from happening. Why Are Security Gates More of a Deterrent Than Burglar Alarms Or Security Cameras? Burglar alarms and security cameras are certainly not visible deterrents in high crime regions and police can not respond to all legitimate calls in timely manner. The result is your property is entered and the damage is done to your home or business. As a result, property and goods are stolen and the thieves may be caught later on with the aid of the security camera recording. On the other hand, observable protection to warehouse bay doors, storefront and home retractable window gates are an obvious crime prevention tool that will without doubt keep your home or business protected. 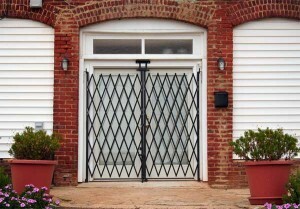 Tampa Bay Security Gates can assist you with all your visible security gate needs. Why Galvanized Steel Folding Security Gates? Our heavy duty galvanized scissor security gates can stand up to the harshest weather and are rust resistance. Tampa Bays folding security gates have a coating that adheres to steel 10 times stronger than paint that means they’ll be virtually maintenance free. If you cannot find what your looking for please call our gate experts to receive a FREE QUOTE. All gates are manufactured 100% in the USA. We also can build you a custom made security gates to meet your specifications.